Most leaders have some form of change project or programme going on. With the amount of uncertainty and the challenging economic climate getting projects to work is crucial and yet the statistics on the success of change in business are dire. Something like 70% of change programmes fail or only partially succeed. For leaders that is high risk. In a recent Economist report a lack of buy-in from people was the cause sited as the reason for the failure. The findings from neuroscience on how the brain responds to change are some of the most robust and challenge conventional approaches. The research shows us why change is painful, why it is resisted, and what leaders can do to make change easier and to institute new ways of working. Leaders tell us that the resistance wilful. At an intellectual level people agree with the proposition. But, people find it hard to make the shift to new ways of working and even when they do for a short while they often revert to their old ways of working after a time and incentives and threats drive resistance underground. In other words there is no logical reason for people to continue working in the old way. Lets, reflect on our personal experience of change. Have you always embraced change? Have you found it easy? Consider not just organisational change but the personal ones too, like a new exercise regime or a new habit you want to adopt. We have all failed to make changes, even when logically we know the direction is right. Some people seem to handle change better than others, and one theory suggests this is related to the degree of arousal they experience. In a neuroscience context, arousal is determined by the level of the chemical catecholamine. Everyone needs a degree of arousal to get off the sofa and take action. Too little arousal results in lethargy. Too much creates stress, which affects our memory, our ability to focus and creates feelings of panic. Different people need different amounts of arousal to achieve optimum performance, and it may be that the base level of arousal of people who generally welcome change is lower than those who find change difficult. Their lower arousal enables them to have a greater tolerance of the stimulus created in the brain when change occurs. Whereas people who already have a high natural state of arousal are “pushed over the edge” by the prospect of the uncertainty that change creates. And someone’s response will also vary under different circumstances. So an employee who is moving house, whose parent is ill, or whose teenager is leaving home may be less tolerant of change in their workplace. The solution is not to recruit a team of low-arousal sofa-sitters, but to think about what is going on for individuals. Instead of labeling people as difficult if they react strongly to change, it makes more sense to work to reduce their arousal. You can see a summary of this research in the video Reactions to change. At Head Heart + Brain we have been working with leaders in organisations to adopt a brain -savvy approach to change. This uses the findings of neuroscience and applies them to change, thus helping to manage arousal and reactions. We created the CORE model; it stands for Certainty, Options, Reputation and Equity. Neuroscience has found that these are the areas which are most likely create a threat or reward response in social situations, like work. 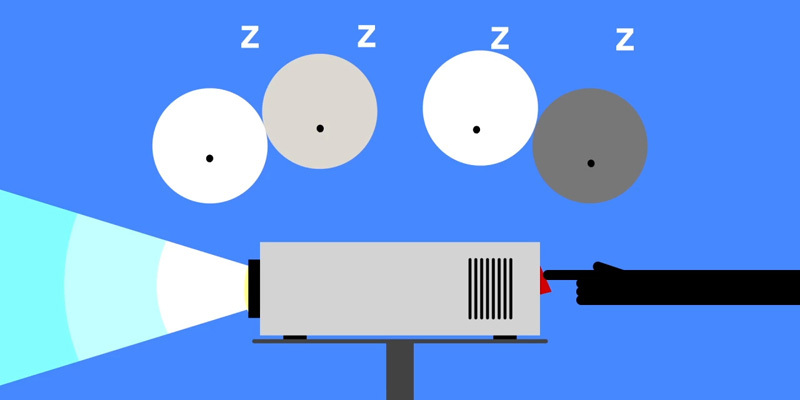 You can see more about the core model in our video of the same title. These four elements activate either the “primary reward” or the “primary threat” circuitry of our brains. For example, a perceived threat to our sense of equity activates similar brain networks to a physical threat to ourselves. In the same way, a perceived increase to our reputation activates the same reward circuitry as receiving a monetary reward. The reaction happens automatically and instantaneously and triggers our response before we’ve even had a chance to consider it rationally. You’ll find that threats are flagged up more often than rewards as we apply the CORE model. This is because our brains are wired to prioritise responding to threats because they’re critical to our survival. At work that means we need to offer many more rewards than you might expect in order create a feel-good response to a new initiative. And one threat can undo the benefits of a number of reward offerings. You’re looking at restructuring a department which will mean that staff will have to apply for the newly structured positions. The people involved will experience the changes as threats or rewards in any or all of these four CORE areas. Moving to a new job can create a threat to someone’s sense of Certainty because they don’t have any experience of that new role, they may not have worked to that line manager before, and they may not be as confident of their abilities in that area. On the other hand, if they are given some choices about the roles they can apply for, the location they might be working in, or their job structure or title, they might perceive a reward to their Options. Having got the job they may feel their Reputation and their responsibilities within the team have been enhanced. And at the end of the process, even if everyone didn’t get a job in the restructure, if the process was robust and transparent their sense of Equity may be satisfied. Whether people feel a threat or a reward will have a significant impact on their problem-solving, their decision-making, the amount of stress they experience, as well as collaboration and motivation. Knowing the drivers that cause a threat response enables us to design initiatives to minimise them. Understanding the drivers that can activate a reward response enables us to motivate people more effectively. In a stable environment there is clearly great value in being able to recognise these many responses, for example using them to light up reward pathways using different methods to the conventional pay rise or promotion. In times of change, understanding these responses is even more important. When the status quo is disrupted people will be constantly and unconsciously scanning for ways in which they are threatened in all of these CORE areas: they will be the subtext of every team meeting, the subject of every water-cooler conversation. Scanning for and analysing these perceived threats will divert resources from their prefrontal cortex: the part of their brain responsible for planning, decision-making and moderating behaviour. 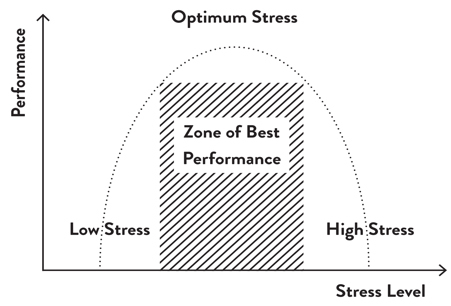 Performance and productivity will suffer as a result, decreasing morale and maximising disruption at a critical time. If we can move a perceived threat from an unconscious to a conscious level it can be addressed. That may be as simple as a leader giving a categorical assurance of security or continuity, or devising alternative rewards that will compensate for threats. 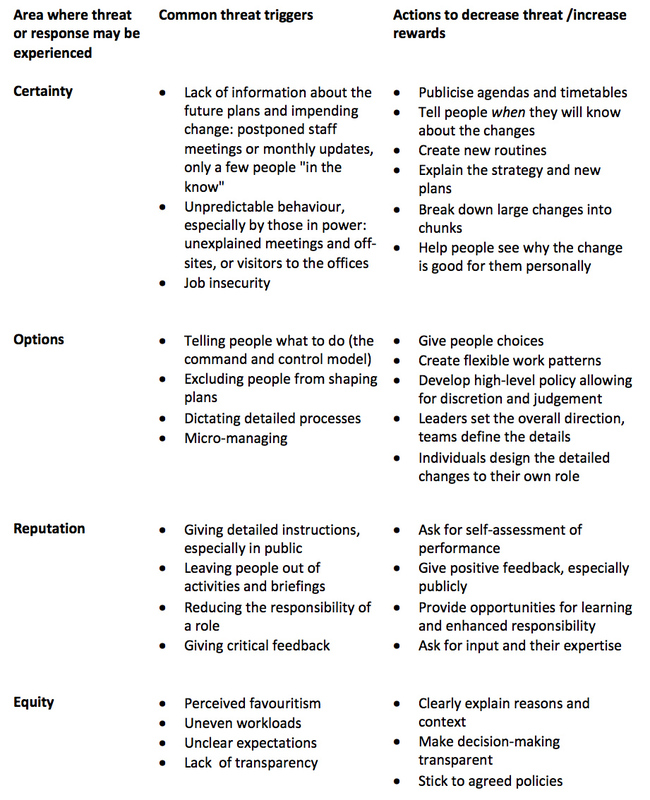 Below are some of the typical threat triggers produced by a change scenario in each of the CORE areas, and the initiatives that may limit the threat or offer alternative rewards: invaluable tools for leaders driving change programmes. Economist Intelligence Unit (2011). Leaders of change: Companies prepare for a stronger future. The Economist. Matthew Lieberman and Naomi Eisenberger (2008). The pains and pleasures of social life: A social cognitive neuroscience approach. NeuroLeadership Journal 1. Trey Hedden and John Gabrieli (2006). The ebb and flow of attention in the Human Brain. Natural Neuroscience 9. Evian Gordon (2000). Integrative neuroscience: Bringing together biological, psychological and clinical models of the human brain. Singapore Harwood Academic Publications. Caroline Zink, Yunxia Tong, Qiang Chen, Danielle Bassett, Jason Stein and Andreas Meyer-Lindenberg (2008). Know Your Place: Neural Processing of Social Hierarchy in Humans. Neuron 58(2). Golnaz Tabibnia and Matthew Lieberman (2007). Fairness and Cooperation Are Rewarding: Evidence from Social Cognitive Neuroscience. Annals of the New York Academy of Sciences 1118. 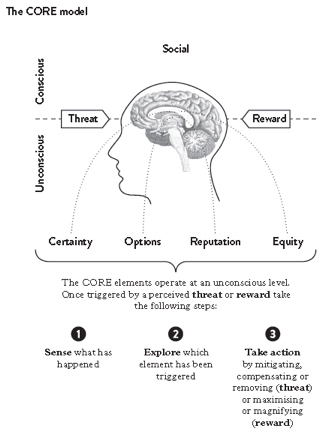 Applying an understanding of threat and reward to business. Looking deeply at change.